What were the Apple India people thinking?? 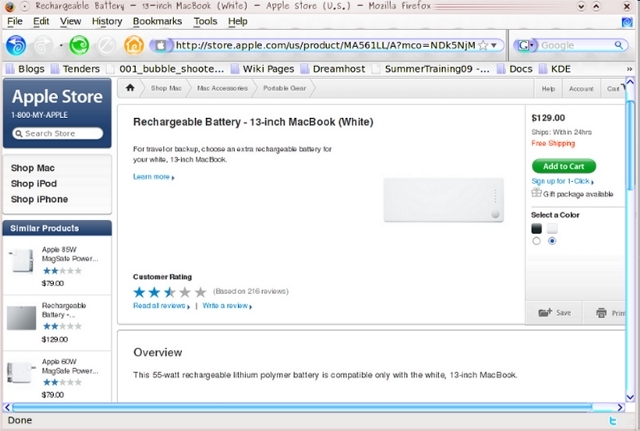 So…Indra’s *white* 13″ macbook battery has given up its ghost. And therefore, we have been looking at the prices of a replacement battery. Well…a friend of ours, Arindam “Mak” Ghosh, gave us a link to the Indian Apple Store. Price set at Rs 6500 (About USD $130), not as much as I had been thinking it would be…but still…will put a good dent in the pockets. Well…imagine my surprise when I found this!! 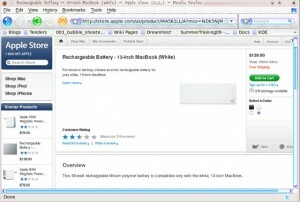 Where the US Apple store states that the white Macbook battery states that it only works with the *white* Macbook. 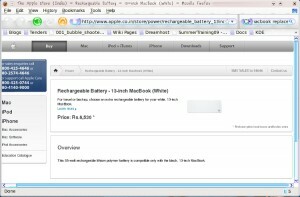 Does Apple India even realize their mistake? Even realize that people notice? That people even wonder what the hell they were thinking when they wrote it? One would think that they were just being lazy and copied it from the black page without even editing it! Such carelessness, and stupidity, and that too for a premium brand! Hardly inspiring.